Dancers perform at the Albany farmers’ market on Fourth Avenue on July 16. “National Night Out” is coming up in a couple of weeks. And when people in various neighborhoods get together for the usual block parties and such, it will be good if the activities draw participation from everybody including Albany’s Latinos. I’ve been reading — when temporarily running out of other things to read — the minutes of the monthly meetings of the Albany Human Relations Commission. One of the recurring themes is the need for more inclusion in the community of, and participation by, people of Hispanic descent. 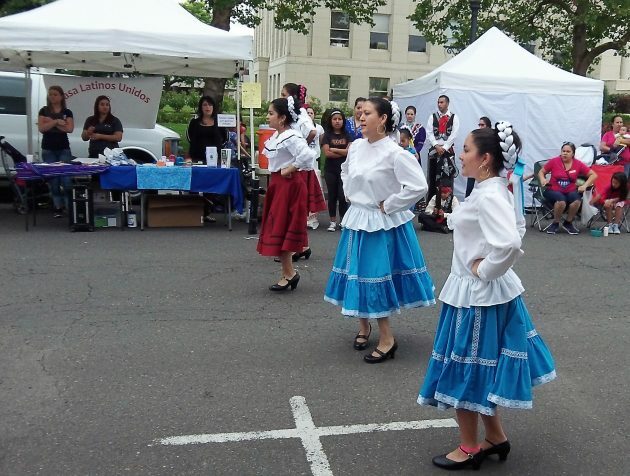 As was the case at the Albany farmers’ market last Saturday, the public occasionally gets treated to cultural events featuring Albany’s largest ethnic or cultural minority. (Latinos make up around 13 percent of the city’s inhabitants, according to the latest census estimates I could find online.) And just about everybody in town is in touch with Latinos almost every day — in stores, restaurants and so forth. Yet it’s hard to avoid the impression that there’s an invisible barrier, a language barrier if nothing else. I’m not aware of any way in which the fire department could or would harass anyone, let alone Latinos. But the comment illustrates the problem. There was some instruction and audience participation as well last Saturday. Nice post. The local National Association of Colored People is looking for members. I am quite sure you could attend and join, per recent news articles. There being about no black people in Linn. Go for it. Thanks for the lead-in, Hasso. There is an Albany Latino Art Show at City Hall coming the month of August with a free artists reception on Sunday, Aug. 7 from 2 – 4 pm. Learn more about the Latino culture. 19 Latino artists from the Pacific NW will be displaying paintings, pottery, kiln formed glass, mesoAmerican masks, and sculptures. Albany Latino Art Show Facebook page: https://www.facebook.com/Albany-Latino-Art-Show-1037630772993565/ has a photo album for each artist with examples of their works. Check it out and please come to the reception on Aug. 7 with locally made Latino foods and drinks. 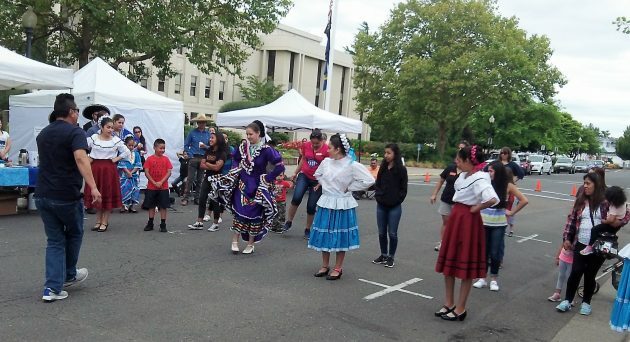 And Festival Latino at Monteith Riverpark, noon-4 pm, Sunday, September 25, free, open to everyone. Looks like opportunities to learn about other cultures that are here …now… & not leaving abound. Granted Oregon is not all that diverse compared to other states, but diversity makes us stronger in our own little melting pot.